NAVIGATING the complex sale of a yacht? No serious buyer of a yacht will have any problem finding 5 Oceans’ listings online. They are posted on the most popular yacht search sites in the world, including yachtworld.com, boats.com, Rightboat.com, MultihullCompany.com, and over eight other popular search sites around the globe. It’s 5 Oceans’ own website, however, that is the real draw to potential buyers. 5 Oceans’ site is full of quality information, pictures and videos, and customer friendly information to help yacht sailors. The site does not require registration and as a result is considered the “stickiest” boat and yacht website in the world – we not only get a lot of visitors, but our visitors spend more time on our site than any other. Print advertising is costly, but research has shown it works by not only bringing listings to the attention of qualified buyers, but by establishing confidence in 5 Oceans’ brand with international buyers and sellers. 5 Oceans runs extensive advertisements in Cruising World, Multihull Quarterly, SAIL Magazine, All At Sea, Multihulls World, Multicoques (French Version) Magazines, and Blue Water Sailing. To thrive in the international yacht marketplace, where contracts are made in many different currencies, 5 Oceans has established multi-currency escrow accounts with Wells Fargo, a leading U.S. financial institution. 5 Oceans holds dedicated escrow account for all of the major currencies and can easily handle conversion of funds for clients which can greatly ease the purchasing process for Australians, Euro-zone buyers, British, Canadian and even American buyers along the way. Because 5 Oceans is a large company, well established, licensed and bonded, foreign buyers are comfortable escrowing deposits in our accounts easing the way for a sale that would never occur with a small, unlicensed brokerage company. 5 Oceans also works with a range of lenders that are prepared to lend to qualified buyers in just about any location around the world. Because 5 Oceans sells voyaging yachts, they end up all over the world in ports large and small. What this means for a buyer is that 5 Oceans Marine Group may have a boat listed for sale in the South Pacific, or in Asia, or Europe at any given time. For this reason, 5 Oceans lists each and every yacht it sells as being “available for co-brokerage” which means that it can be purchased by any buyer who is represented by a professional yacht broker anywhere in the world. At 5 Oceans, we recognize that the most important thing for our clients is that the yacht sells. At 5 Oceans, the brokers are Old School – buying from others, and allowing others to buy from them, is the way to fairly and ethically deal with worldwide deal making. 5 Oceans assists with purchases and sales around the world. That expertise allows us to provide sellers with a very accurate picture of what the market price of their yacht should be in its current condition. That is perhaps the most important thing the brokers do at 5 Oceans Marine Group. A seller never wants to price his yacht too low, but he does not want to risk overpricing either. The risks of overpricing are real and can be felt in depreciation, dockage and maintenance fees as well as insurance until it sells. At 5 Oceans Marine Group the peerless advantage the firm has is being able to counsel both buyers and sellers on current market values so they can either make offers with confidence, or accept offers with confidence. Because 5 Oceans buys and sells boats and yachts exclusively, clients can recognize and trust the expertise and the data behind the pricing recommendations. At 5 Oceans, the pledge to provide service and support to its clients extends beyond the waters of the United States. 5 Oceans Marine Group relies on a trusted network of global partners, contacts and associations to serve its client’s needs. Whether that means setting up a survey in Fiji, a haul-out in Marmaris, or a yacht inspection by one of its agents in the South of France, 5 Oceans does what is needed to assist buyers and sellers. In addition, 5 Oceans is able to offer a range of storage, haul, docking, and refit services in the Caribbean, Europe, North America and elsewhere in the world. 5 Oceans regularly participates in a range of boat shows around the world, including the Annapolis Boat Show, the Miami Boat Show, the Oakland Boat Show, the Paris Boat Show, Cannes Boat Show, Dusseldorf Boat Show, and, most recently, at the Sanctuary Cove Boat Show in Australia. Buyers and sellers alike are familiar with 5 Oceans bright red tent and its staff who stand ready to discuss the sale or purchase of a yacht. At the end of the day, success for the seller is all about the broker. There are plenty of examples of large marketing budgets spent in service of failing enterprises. Anyone who has spent time in the yachting industry knows that good brokers sell boats, weak brokers a few, and down from there. A good broker earns the loyalty and respect of both buyers and sellers while a weak broker is simply unable to engender the trust required to bring parties together to close a sale. 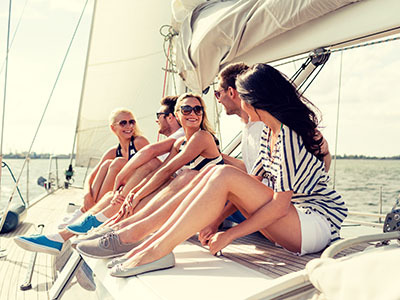 At 5 Oceans Marine Group, we have assembled the most highly educated, well trained, ethical and skillful team of yacht brokers in the boating industry. NEED HELP SELLING A YACHT? In the end, a serious seller has several options to pick from when he decides to sell his boat. At 5 Oceans, we believe our passion for yachts, our strong balance between buyers and sellers, our vast experience, and our reputation for integrity make us the clear and logical choice. No serious buyer of a yacht will have any problem finding 5 Oceans’ listings online. 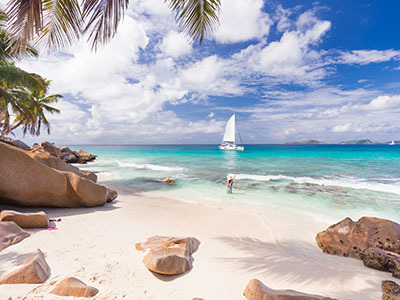 They are posted on the most popular yacht search sites in the world, including yachtworld.com, boats.com, and over eight other popular search sites around the globe. It is 5 Oceans’ own website, however, that is the real draw to potential buyers. 5 Oceans’ site is full of quality information, pictures and videos, and customer friendly information to help yacht sailors. The site does not require registration and as a result is considered the “stickiest” boat and yacht website in the world – we not only get a lot of visitors, but our visitors spend more time on our site than any other. Print advertising is costly, but research has shown it works by not only bringing listings to the attention of qualified buyers, but by establishing confidence in 5 Oceans’ brand with international buyers and sellers. 5 Oceans runs extensive advertisements in Cruising World, Multihull Quarterly, Latitude 38, 48 North, All At Sea, Multihulls World, Multicoques (French Version) magazines, and Turkish Yachting. To thrive in the international yacht marketplace, where contracts are made in many different currencies, 5 Oceans has established multi-currency escrow accounts with Smith Barney and Citibank, leading U.S. financial institutions. This eases the purchasing process for Australians, Euro-zone buyers, British, Canadian and even American buyers along the way. Because 5 Oceans is a large company, well established, licensed and bonded, foreign buyers are comfortable escrowing deposits in our accounts easing the way for a sale that would never occur with a small, unlicensed brokerage company. 5 Oceans also works with a range of lenders that are prepared to lend to qualified buyers in just about any location around the world. Because 5 Oceans sells voyaging yachts, they end up all over the world in ports large and small. What this means practically for a buyer is that 5 Oceans Marine Group may have a boat listed for sale in the South Pacific, or in Asia, or Europe at any given time. For this reason, 5 Oceans lists each and every yacht it sells as being “available for co-brokerage” which means that it can be purchased by any buyer who is represented by a professional yacht broker anywhere in the world. At 5 Oceans, we recognize that the most important thing for our clients is that the yacht sells. At 5 Oceans, the brokers are Old School – buying from others, and allowing others to buy from them, is the way to fairly and ethically deal with worldwide deal making. 5 Oceans Marine Group assists with purchases and sales around the world. That expertise allows us to provide sellers with a very accurate picture of what the market price of their yacht should be in its current condition. That is perhaps the most important thing the brokers do at 5 Oceans Marine Group. A seller never wants to price his yacht too low, but he does not want to risk overpricing either. The risks of overpricing are real and can be felt in depreciation, dockage and maintenance fees as well as insurance until it sells. At 5 Oceans Marine Group the peerless advantage the firm has is being able to counsel both buyers and sellers on current market values so they can either make offers with confidence, or accept offers with confidence. Because 5 Oceans buys and sells boats and yachts exclusively, clients recognize and trust the expertise and the data behind the pricing recommendations. At 5 Oceans, the pledge to provide service and support to its clients extends beyond the waters of the United States. 5 Oceans Marine Group relies on a trusted network of global partners, contacts and associations to serve its client’s needs. 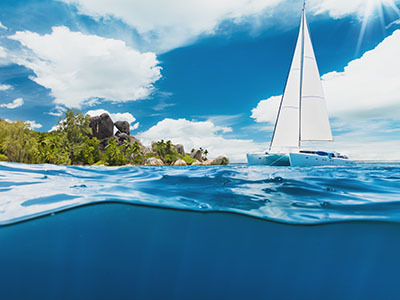 Whether that means setting up a survey in Fiji, a haul-out in Marmaris, or a yacht inspection by one of its agents in the South of France, 5 Oceans does what is needed to assist buyers and sellers. In addition, 5 Oceans is able to offer a range of storage, haul, docking, and refit services in the Caribbean, Europe, and North America. 5 Oceans regularly participates in a range of boat shows around the world, including the Annapolis Boat Show, the Miami Boat Show, the Oakland Boat Show, the Paris Boat Show, Cannes Boat Show, Turkish Boat Show, and, most recently, at the Sanctuary Cove Boat Show in Australia. Buyers and sellers alike are familiar with 5 Ocean’s bright red tent and its staff who stand ready to discuss listings. At the end of the day, success for the seller is all about the broker. There are plenty of examples of large marketing budgets spent in service of failing enterprises. Anyone who has spent time in the yachting industry knows that good brokers sell boats, weak brokers a few, and down from there. A good broker earns the loyalty and respect of both buyers and sellers while a weak broker is simply unable to engender the trust required to bring parties together to close a sale. At 5 Oceans, we have assembled the most highly educated, well trained, ethical and skillful team of yacht brokers in the yachting industry. 5 Oceans Marine Group has grown market share every year since it first opened its doors in 2000. In the middle of the global recession, 5 Oceans outperformed its competitors – selling yachts in what was – and may yet still be! – easily the worst market in most of our lifetimes. 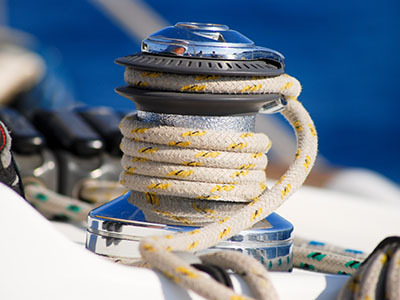 While its competitors shed brokers and costs, 5 Oceans kept focused on the sailor and his or her needs. It invested in the future and did not cut costs or brokers. In each of these difficult economic times globally, 5 Oceans sold tens of millions of dollars worth of boats around the world. The value of the average yacht 5 Oceans Marine Group sells is $425,000, almost double the value of the yachts sold by its nearest competitor. 5 Oceans Marine Group sells larger yachts and those of more value than any full-service brokerage firm in the world. This alone makes 5 Oceans the clear choice for those sellers who want to reach a highly educated, sophisticated buyer that can afford to own and invest in voyaging yachts anywhere in the world.